Whether you are in need to replace some logs due to rot or need to have some maintenance work done on your home, you can trust 888-LOG-GUYS to do the best job for the right price! Our crew has worked many hours to ensure the satisfaction of our customers, and you are no exception! We look forward to your request for a quote either online or by giving us a call. 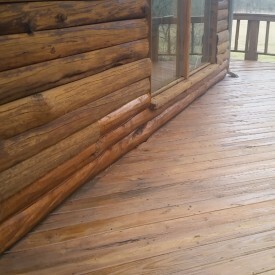 We will do what it takes to preserve or improve your log home or cabin! You may have heard about our restoration process, but don’t let the big words intimidate you. Our crew at 888-LOG-GUYS know what they are talking about and they will prove it through their work. Our process includes corn cob, glass, walnut, or sand blasting (media blasting), sanding, cleaning with a borate treatment, energy seal, and staining. Don’t mess around with making this a DIY log home project! Get the LOG GUYS to do it all to put your mind at east! You may be concerned about the health of your logs. No one would like to see their home deteriorate due to rot or bird, bee, and insect holes. At 888-LOG-GUYS, we have repaired or replaced more logs than any other company! We have the experience and know-how to get the job done right! Call our number or click on the link in the top right corner to send us a request for an estimate! You may have noticed the white stuff between the logs in peeling. Or you noticed that there isn’t any white stuff between the logs at all. Request a quote to find out how we can either replace the energy seal already there or apply the first one on kyour log home or log cabin. Keep out the bugs, water leaks, and air drafts! We want to make sure your Manchester Tennessee home is comfy, cozy, and sage. Is there something else you have envisioned for your home to make it better? Would you like a log staircase, or log railings? 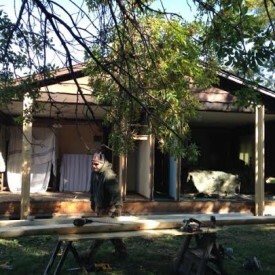 Would you like a new deck or porch? 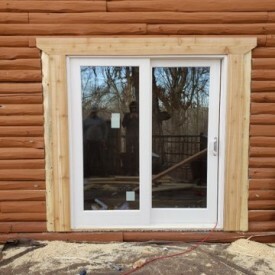 At a minimal cost to you, our company would love to make your dreams a reality to improve the look or value of your log home. The LOG GUYS have experience making improvements on log homes or log cabins. Don’t delay! Contact us by phone or online! We know how important it is to make sure log home owners stay on track to preserve their home. Time flies fast, and then pretty soon you may be wondering, “Is it time to get the house re-stained?” Not to worry! Let our team do that work for you! We are prepared to get your home in great shape, and you can rely on us to keep track of when it is due for some more tender loving care.